In late September 2014, Hong Kong secondary and university students began class boycotts to protest a decision announced by the Standing Committee of China’s National People’s Congress in August 2014 that Hong Kong citizens would be able to elect their chief executive by “universal suffrage” in 2017, but that the NPC would vet eligible candidates. Responding to the NPC decision in August, leaders of Hong Kong’s Occupy movement said the NPC interpretation did not amount to universal suffrage: “Genuine universal suffrage includes both the rights to elect and to be elected. The decision of the NPC Standing Committee has deprived people with different political views of the right to run for election and be elected by imposing unreasonable restrictions, thereby perpetuating ‘handpicked politics. '” Martin Lee, founding chairman of the Democratic Party of Hong Kong, called the Occupy protests that began on September 26 the “last stand in defense of Hong Kong’s core values, the values that have long set us apart from China: the rule of law, press freedom, good governance, judicial independence and protection for basic human rights.” Hong Kong’s chief executive, CY Leung, responded to Lee’s remarks here. 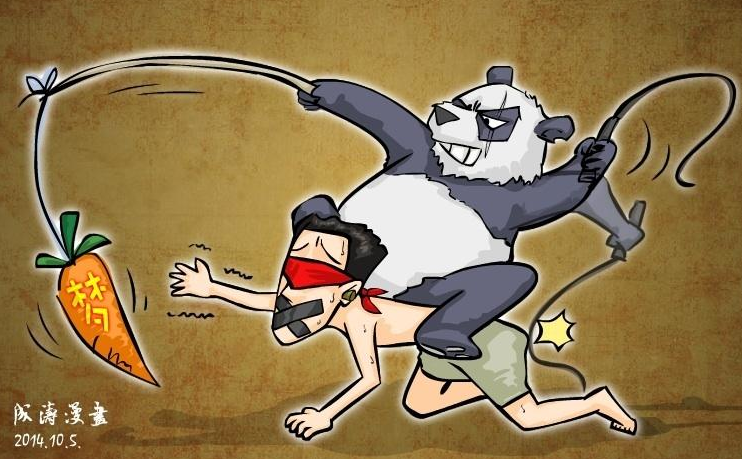 In the following cartoon, posted by artist Cheng Tao (成涛) to both Sina Weibo (deleted) and Twitter, China and its ruling Chinese Communist Party are depicted as a sadistic Panda bear riding on the back of Hong Kong, which is blinded by a red (CCP) blindfold and coaxed forward toward the “carrot” of democracy. The carrot is labeled “dream,” a reference to Xi Jinping’s “Chinese Dream.”.